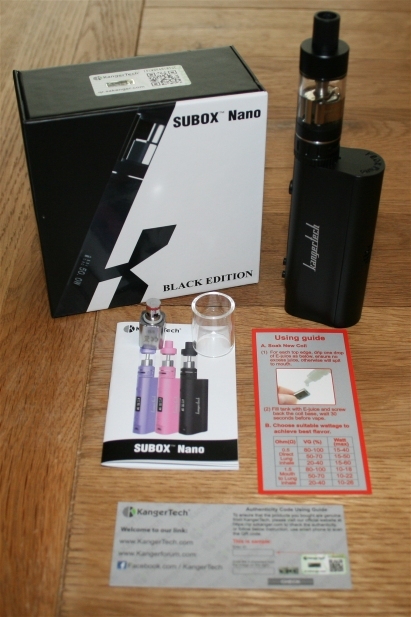 The KangerTech Subox Nano is the replacement for my old Kingo which I bought as a starter kit years ago. When I was looking around at various vaping products I really wanted something different and that’s where the KangerTech Subox Nano comes in. 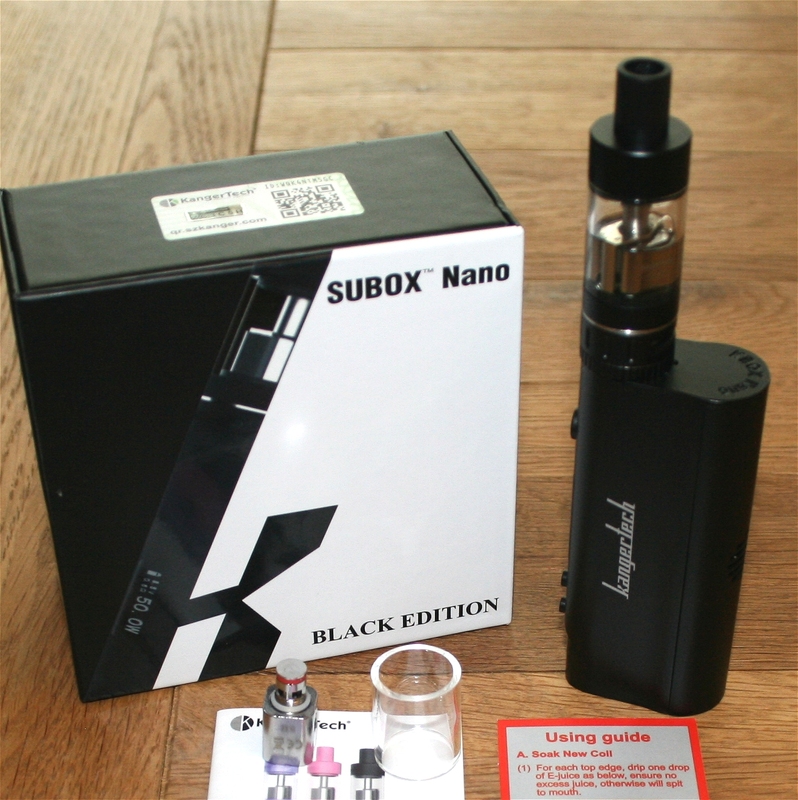 It was priced right with an offer at £50, give or take postage, and had that chunky look and feel about which appealed to me – note that this is not the subtank or mini version – it is the SUBOX NANO. So lets take a look at what I purchased in the knowledge that I don’t sell for KangerTech – so what you get here is a REAL REVIEW rather than someone doing a review in order to flog these things. I have been vaping for around 5 years – to be honest I can’t actually remember how long ago I started, so again – this is an authentic review by someone who knows a thing or two about vaping and has used these devices for years and not smoked a single cigarette during that time. The KangerTech Subox Nano Starter Kit – whats in the box? The box contains everything you need to get vaping (except juice and battery). The actual hand held part (which holds the battery and supplies power to the coil). An authenticity card allowing you to verify that your purchase is a genuine Kangertech item. You will need a high drain re-chargeable Lithium Ion battery (3.7v 3500mAh with a discharge current of 20Amps). You will also need a USB type mains adapter OR an available USB 5v port on a PC from which you can charge the battery. Now the battery (Efest) itself was provided as a bundle by the site I bought the kit from – so be aware if you order this that there is no battery in the standard kit – most sellers provide this as a matched add-on or a separate basket item. How to Use the Kangertech Subox Nano from the very start. The first step is to insert the battery into the compartment for charging. The compartment is covered with a very handy magnetic cover which simply pops off when you give it a push in the right direction – always check the polarity of the battery and the markings on your vaper before putting it in. Once in, you can take the assembled tank and fill it with juice, prime it first by squirting a few drops into the coil after removing the glass and exposing the coil box (this is mentioned and described in the instruction manual provided). Then, screw it all back together ensuring that the tank remains in the correct position so as not to spill the liquid. (Personally I prefer the top fill method vape sticks or pens whereby you just remove the mouthpiece rather than tip everything upside down – but not to worry). To charge the battery, connect the USB cable into the body of the kanger at the base and attach the other end to an appropriate electrical supply. A display will appear which indicates the battery charge progress – quite handy when you are eager to get vaping and you can measure how long you have left before it is ready. My battery came with some charge in it – only a bit – so I left it connected until all the bars on the indicator were lit. This took around 3 hours. How you go about your vape is now down to you – but that’s basically all there is to setting up. My Thoughts on the Nano Vape Experience. I am probably slightly tainted in my views here – so this is definitely only down to my personal preference and what I am used to. On the downside (for me), when vaping I prefer to encounter some resistance as I draw the vapour in, in other words, I am a vape to mouth and then mouth to lung user – as opposed to vaping by breathing directly from the kanger into my lungs. With older vape sticks I had this resistance, but with the kanger nano – I do not. There are three settings available on it which allow me to set the rate at which the air flows into the device, but even the lowest setting (which is supposed to offer the highest level of resistance) is still open enough to allow sufficient air to pass through to the point that I can breath straight into my lungs. So there is very little resistance offered. On the actual mouthpiece I am really impressed – in that it is plastic. I have a very personal dislike to the metal ones which feel cold on my teeth should they come into contact – but a plastic one is fine although I would prefer it if it had a moulded shape to it – more ergonomic rather than just being a straight cylindrical design – no biggie. It could be longer aswell – my lips rest against the top of the tank. Again though I find myself thinking that this is something I dislike because it is different than what I have been using for such a long time. The milled edge on the image below is for unscrewing the entire top section. Just above that you can see three grooves for gripping the band which goes right around the assembly and turns to expose the holes through which the air passes as you inhale or draw. The kit feels heavy and strong – I like – I get the impression that I have a quality product in my hand every time I grab it. Additionally it stands upright – so even though the tank is sealed, you don’t have any concern about leaking juice when you put it down on a desk for example. The fire button is firm and has a very slight but confident contact “click” when pressed – and this can also be used via rapid pressing – to switch off the circuits so that inadvertent pressing whilst it is in your pocket doesn’t cause it to fire. It also has a 10 second cut out safety feature to prevent overheating. I am quite a heavy vaper – I can go through two or three tankfulls per day. At my current rate I would say the battery will last around a whole day and this is a bit of a downer aswell. The fact that the charger is built into the vape handle means that even though you can vape whilst it is charging, you cannot have two or more batteries in cycle – one in use and one on charge – unless you get another nano or you get your hands on a very specific type of additional battery charger. I am fairly certain these will be available, but I haven’t found one yet, and I am in no doubt that choosing the correct charger for these batteries is of paramount importance. The OLED display on the side of the handle is clear, bright and sharp – it includes the all important battery level indicator so that you know when you are going to need to change the battery. The display updates as you press the +- controls. The large button initiates the transfer of energy to the coil. At the base on the left you can see the USB port. The actual experience of taking a vape is superb once I got my head around the flow. The taste is clean and the flavours come through as they should – with no burnt taste. I would suggest taking it step by step – as this is a powerful gadget and you could easily overdo things and end up feeling ill if you take too much in – it produces huge clouds of vape on demand! In summary – this is a good purchase and a happy transition – a few quirks such as the battery (i have found a charger now whilst writing this!!) and the airflow thing – but overall I feel i’ve done the right thing by moving to this model. The Kangertech Subox Nano is highly likely to be my vape of choice no for the foreseeable future with no regrets – just a little getting used to. If you are a starter looking to buy a kit – this may be a bit too much for you – so take it easy! Coil – the part of the kanger which evaporates the juice / eliquid. OHM – electrical unit of resistance. OCC – Organic Cotton Coil – as opposed to a synthetic wick to soak the juice over the coil. Tank – The part which holds the liquid – this is a 3ml tank. - Fully Configurable to taste.